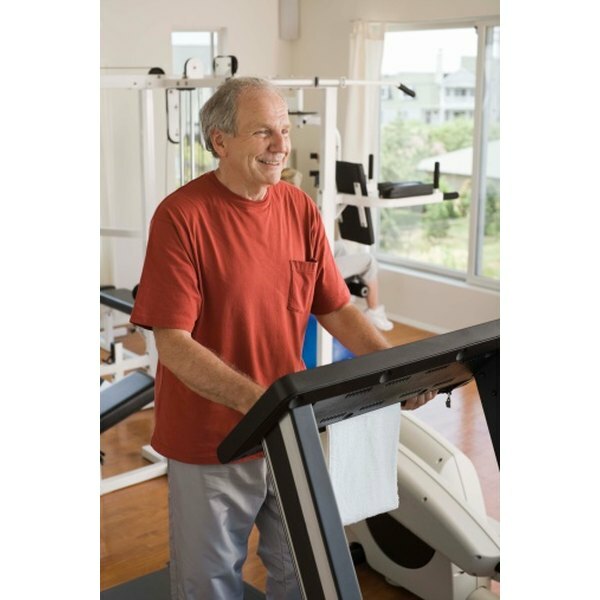 The Naughton treadmill protocol is a method of measuring the coronary health of a patient. As the patient walks on a treadmill, ECG sensors are attached to his chest to measure the heart's electrical activity. The Naughton protocol is one of several different testing options. Each testing method has set guidelines for how the test is conducted the best population to receive that particular test. The Naughton protocol is a sub-maximal exercise test designed to keep you in a heart rate zone that is lower than your maximum heart rate. There are several stages, each one slightly more intense than the last. Your heart rate gradually increases throughout the test with an endpoint target zone that is 80 to 90 percent of your maximum heart rate. The Naughton protocol is one of several exercise treadmill clinical testing procedures. The purpose of the Naughton protocol is to identify or confirm coronary artery disease in a patient. The ECG sensors record the heart's rhythms and activity as the patient performs the test. These tests can confirm rhythm abnormalities and other heart conditions, such as ischemia. The Naughton protocol is less intense than other testing procedures, such as the more popular Bruce protocol. The test has a more gradual increase in intensity and uses lower speeds. For this reason, the Naughton protocol is used for diseased populations, those at high coronary risk. The Naughton protocol starts with a 2 minute warm-up. The speed is set to 1 mph and the incline is set to 0. After the warm-up, the speed is set at 2 mph and does not change for the remainder of the test. The test consists of six, 2 minute intervals. The grade starts at 0 for the first interval, and increases by 3.5 percent every 2 minutes. The more popular treadmill exercise protocol is the modified Bruce protocol. The speed and incline gradually increase over a series of 3-minute intervals. A study published in the "European Heart Journal," found that the Naughton protocol and the modified Bruce protocol are equally effective in detecting ischaemic abnormalities in patients six weeks after a heart attack.